AUCKLAND, New Zealand—Jands NZ recently supplied a multifaceted HARMAN AV system for the Helena Bay Luxury Lodge on North Island, featuring solutions from BSS and Crown Amplification. Situated in the stunning Bay of Islands, Helena Bay Lodge is an 800-acre luxury resort that features four private beaches, a gym, a sauna, a massage room, a 25-meter heated swimming pool, a library, lounge areas, informal and formal dining areas and an outdoor fire pit. 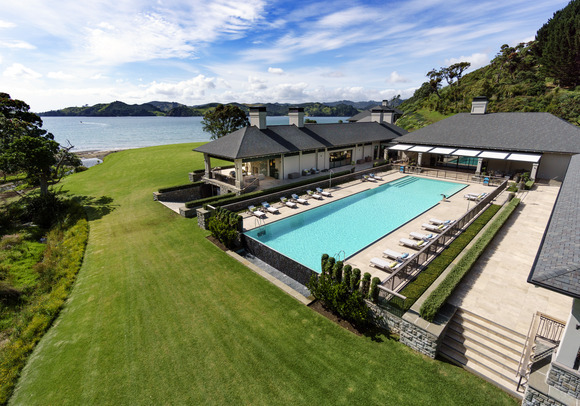 Management tasked Liquid Automation New Zealand with creating a centrally controlled AV system that could comprehensively cover the residences and common areas of the resort. Working in conjunction with Liquid Automation and ABL Group, JANDS NZ designed a cutting-edge HARMAN AV solution featuring Crown amplifiers and BSS processing. The new HARMAN solution offers complete control of the resort’s audio, lighting and video distribution systems, and integrates seamlessly with the existing building management system. “All the sources and outputs were run in stereo which created a complex audio matrix," explained Liquid Automation's Darian Sundar. "To handle such a large number of channels, we had to turn to a high-end professional audio solution, and BSS Soundweb was the obvious and only choice as it is known for sound quality, reliability and flexibility." A BSS Soundweb BLU-800 networked signal processor and Crown DCi amplifiers provide networked control of 46 audio zones spread out over the property, with 126 channels of audio inputs. The system distributes audio over the network to multiple locations, and then via BLU-link from Soundweb to the Crown DCi multi-channel network amplifiers. The audio distribution system is monitored remotely, which was a requirement due to the isolated location of the lodge. Liquid Automation and ABL Group subsequently won the “Best Special Project” and “Best Design and Documentation” awards at both CEDIA Asia/Pacific and CEDIA Americas for this state-of-the-art installation.